Blog Home > Automation > Cross Docking: Is it Right For Me? Will it work for mid-sized distribution operations? This article is the first in a series of articles on the subject of cross docking. Judging by the number of inquiries we receive relative to inventory management in distribution, a look at cross docking practices seems to make sense. This will be the first of a series of briefs on cross docking, how and where it works, and a look at some best practice ideas that might be useful to those of you in the distribution business (of all sizes). I’ll also be providing you links to some excellent online references for more information. Most everyone is familiar with how those like Wal-Mart took the cross docking model, and essentially redefined supply chain efficiency. The results achieved are well-documented. For those of us involved with mid-size organizations, a compelling case can be made for considering cross dock principles in our distribution centers. If you are able to move material from receiving dock to shipping dock, and bypass storage, consider what you gain. Costs associated with holding inventory, protecting it, insuring it, picking it, counting it, and so forth. Although the “cross docking” term is well ingrained in our supply chain lingo, it is important to understand the concept also applies elsewhere in our distribution centers (more on that later), notwithstanding what you call it. Let’s begin. We all deal with a variety of costs in our supply chains. At the top of your list and my list are order-picking costs and inventory holding costs. Your goal is to minimize or eliminate both. In addition, freight cost reductions can also represent significant potential, particularly for those dealing with LTL’s and small package carriers. Most of you, who get this right, are using tools to better manage information, and to better manage or coordinate with your supplier chain partners. It is not necessary to be large in size to take advantage of a cross dock model. Many of today’s solutions are both modular and scalable. These tools allow you, the distributor, to better consolidate your shipments and shorten your cycle time. Most of you deal with products from multiple vendors which enter your distribution centers. These products are typically not ready for direct transfer to your shipping docks. As a result, you must create a label for the product upon receipt, and then move the product to the correct shipping area. This increases costs because a non-value add touch point(s) is required. Essentially, the question is who does the work to prepare the product for shipment. We both would rather the vendor handle it, but that is not always reality. In our case, we scan the incoming shipment, a look up is performed, and a new label is created and applied to the product, readying it for shipment. 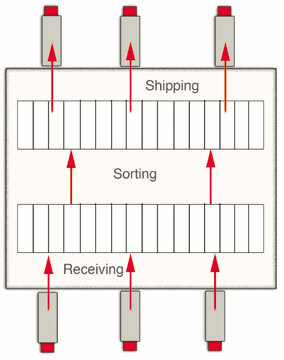 This approach is known by various names, one of which is “post-distribution”. If you negotiate with your vendors to label products that can be cross-docked directly to your shipping area, then you will see terms like, “trans-shipment ready”, “transload ready” (an incorrect usage), or “pre-distribution”. When does cross docking begin to make sense? Begin with considering the order profiles of your key customers. Like us, you may have many customers who tend to order the same products in significant volumes throughout the year, or at least seasonally. In effect, supply and demand are pretty much predictable, allowing you to match each with the other. Begin with these products as candidates. Some products will be filtered out of this mix. For instance, those that require excessive handling in order to move, or products of an unusual shape, size, or excessive weight would be examples. Also, products that are FIFO, or date-sensitive make poor candidates. When you engage in a supply chain enhancement such as cross docking, the players both upstream and downstream of you play key roles. In fact, they will define your success or failure. Our experience is that all can benefit when all are involved. Otherwise, you may simply be going through an exercise in which some costs are passed off to another link in the supply chain. In upcoming briefs, we will look at the following areas. You are welcome to comment below with any questions or comments. Am I wasting my time; is this a viable consideration for my company?